Lightweight Walking / Zimmer Frame With Flip Up Seat. Now this is a clever item. It’s a Clever-Lite LS lightweight walking frame, and has been designed to help you get around with ease. 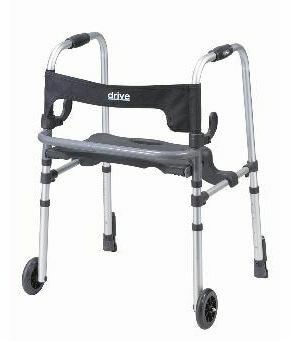 It can be used as a traditional walker, or take a rest by using the flip up seat! The seat has a soft, flexible backrest that provides both comfort and security while you’re taking a well-earned rest – and the push down brakes make sure the walker doesn’t go anywhere until you want it to! And this lightweight Zimmer frame is easily transportable too – it can be easily folded away when not in use. But don’t let this feature deceive you – despite being collapsible, this sturdy walker is suitable for users up to 21 stone.